Hada Labo products are produced by Rohto Pharmaceuticals in a pharmaceutical manufacturing environment, under strict Goods Manufacturing Practice (GMP). 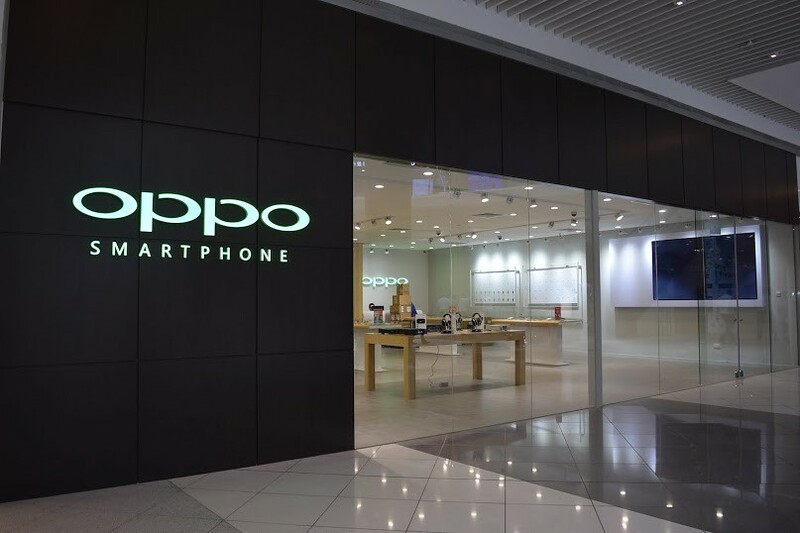 This ensures superior product quality, reliability and effectiveness. 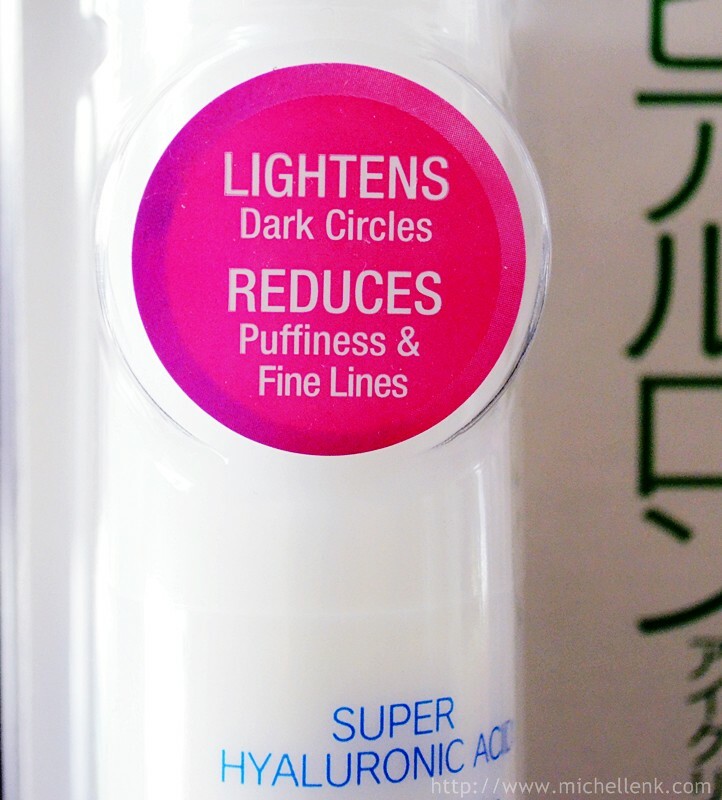 The Super Hydration Power in Hada Labo has now gone Ultra! New ‘Nano’ Super Hyaluronic Acid in Hada Labo boosts its hydration power, and now enables full and thorough hydration from skin surface to deep within. The new ‘nano’ hyaluronic acid molecule is 1/20 the size of the normal hyaluronic acid’s. This enables penetration to areas deep within the skin. The other two hyaluronic acid, ‘Normal’ and ‘Super’ hydrate skin closer to the surface. 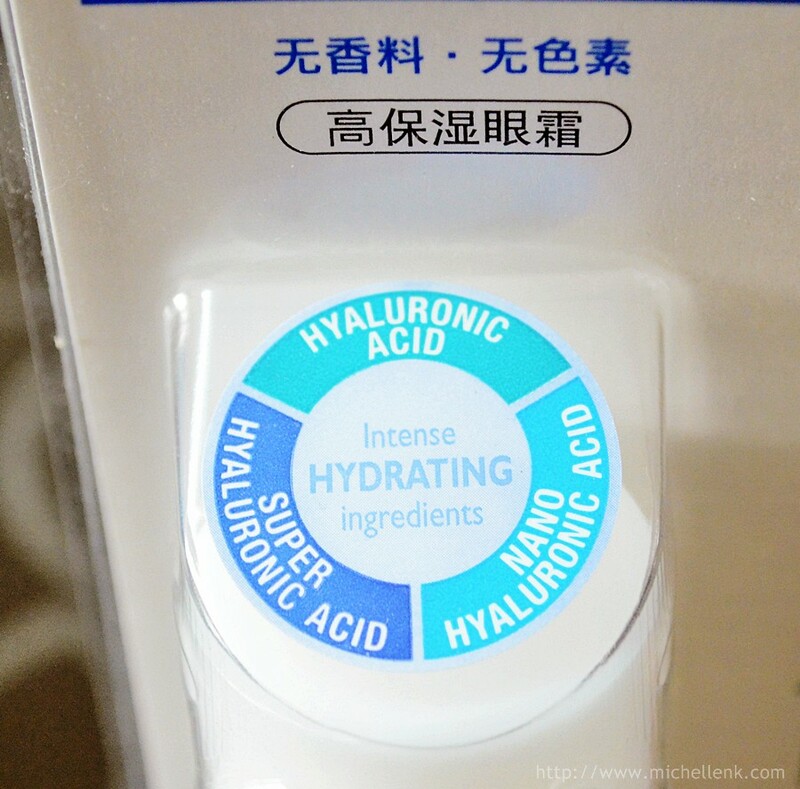 With a superior combination of all three hyaluronic acid (Nano, Super, Normal), Hada Labo Hydrating range can give your skin a deeper and fuller hydration. 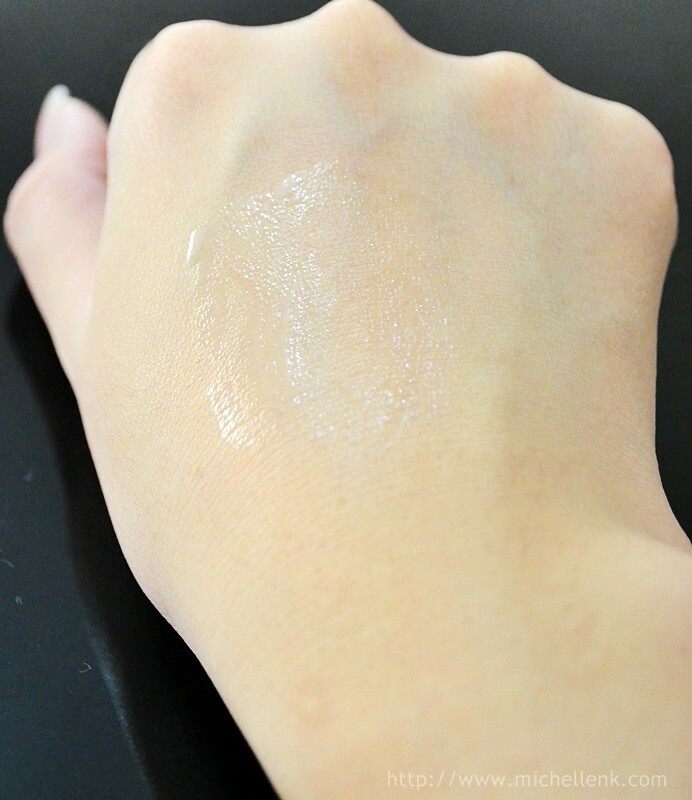 Pour two to three drops on the palm, gently pat onto skin until the lotion is thoroughly absorbed. As you can see from the above picture, I've 2 version of the lotion. The "older" version of the lotion on the left, and the new formula on the right. Noticed that the new formula seems to be better and non-sticky, as per compared to the previous version. Not only that, it seems to be easier to absorb to my skin, and lesser smell. The previous bottle, the older version, lasts me for almost a year, and till now, I still have almost a quarter left. Its rather affordable in my point of view, and now, I uses the new formula on my face, and the older version, on my legs, which is constantly exposed to the sun. ONE DROP UNLOCKS YOUNGER LOOKING EYES! A Combination of 3 Types of Hyaluronic Acid for 3X the Hydration Power! 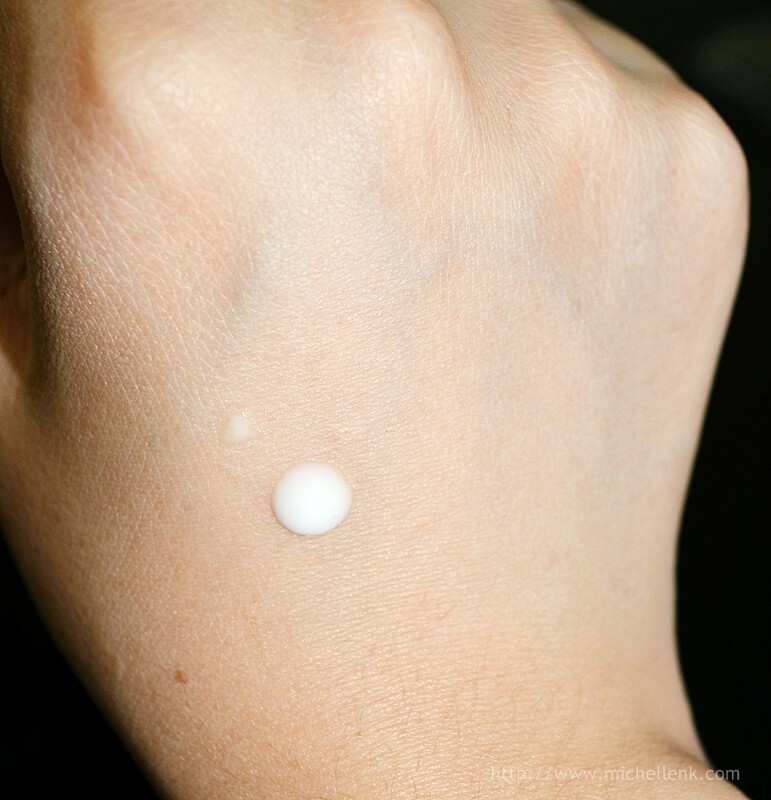 With consumers pleased about the performance of Hada Labo’s hydrating range (100% of Singapore women agree on its instant hydration power*), the brand now introduces a new cream dedicated for the skin around the eyes. This area has thinner skin, and often shows the first sign of aging! 2. ACTIFLOW ingredient increases blood circulation, lightens dark circles and puffiness. 3. Jojoba Oil smoothen fine lines around the eye area. 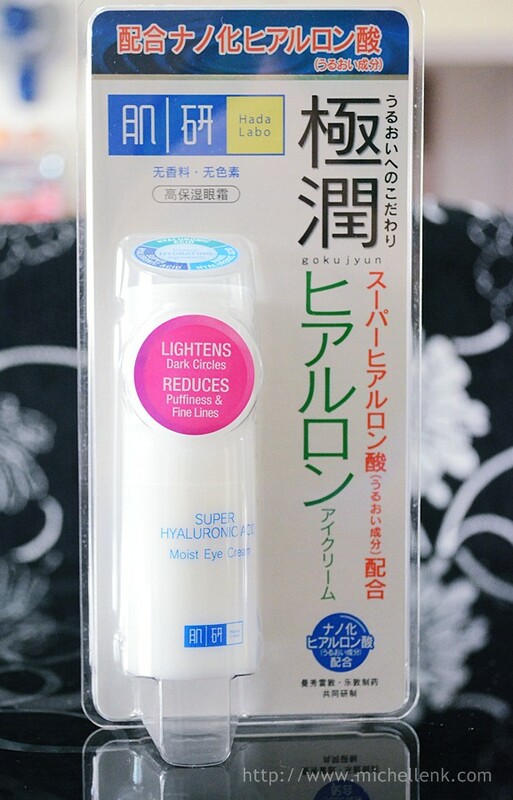 This eye cream is to used twice daily after applying the Hada Labo Lotion by simply dabbing a small amount under and around the eye area using the fingertips. 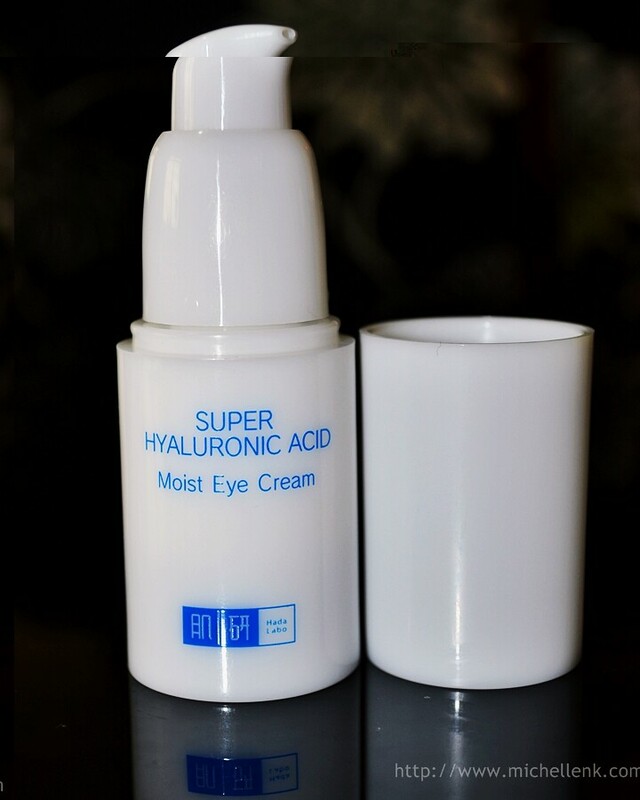 Regular application of the eye cream will improve the skin texture, wrinkles and puffiness around the eyes. What I like about this product is that is odorless, colorless and it absorbs easily. One small drop as per above is more than enough for me to apply for both eyes. I'm not certain about the fine lines and wrinkles though (as I've none of it yet), but it definitely helps to smooth the puffiness. 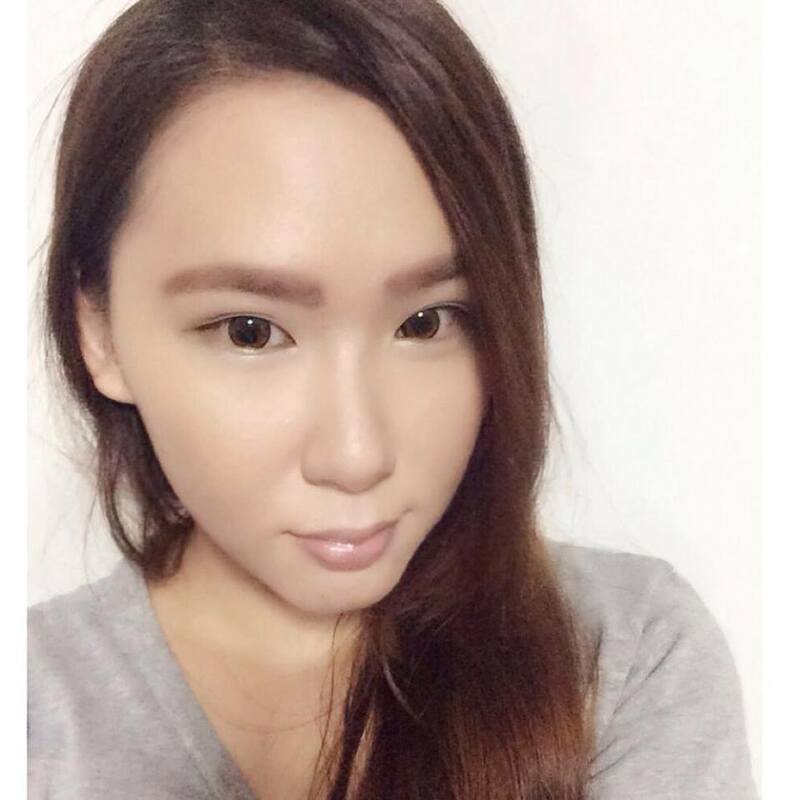 Eyes is slightly less puffy after a while. Its easy to spread too! All you need to do is just to dab it slowly around your eye areas and before you know it, they are gone! It helps to make my eye make up last slightly longer though. 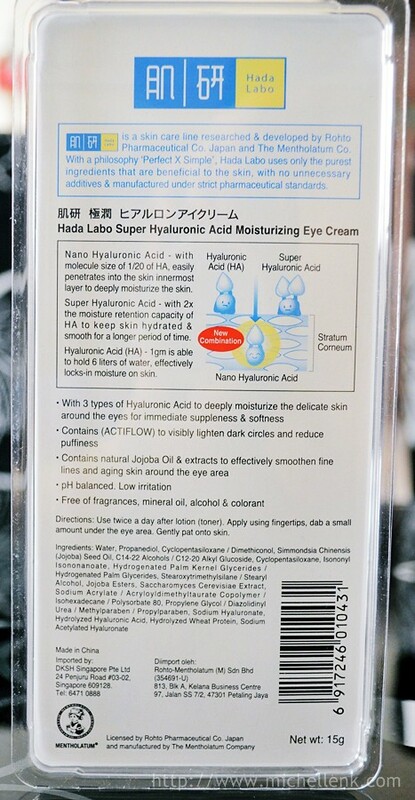 The Hada Labo Super Hyaluronic Acid Moisturizing Eye Cream (15g) will be available at all Watsons nationwide at $21.90. 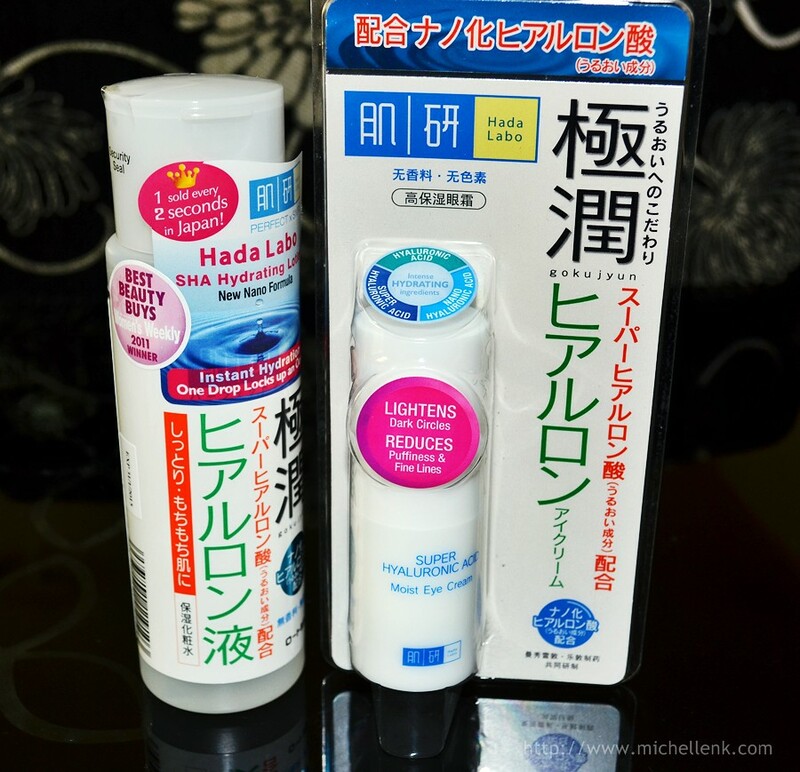 Hada Labo skincare philosophy is “PERFECT X SIMPLE”. Inspired by traditional Japanese beauty wisdom, Hada Labo adopts a “No More No Less” philosophy in the formulation of its products. 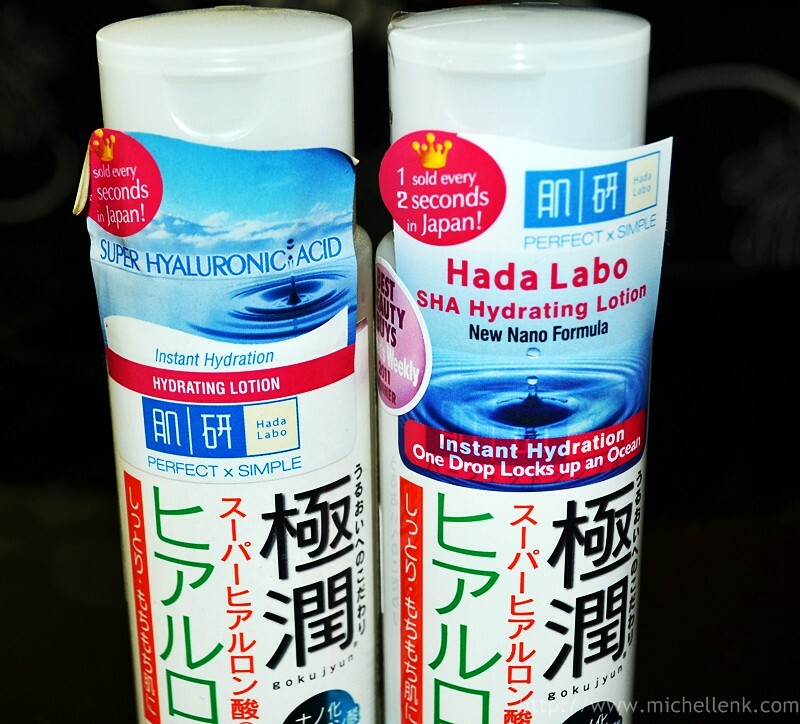 Log on to Hada Labo Facebook page today to claim your own sample of the Hada Labo SHA Hydrating Lotion with the new Nano Formula!